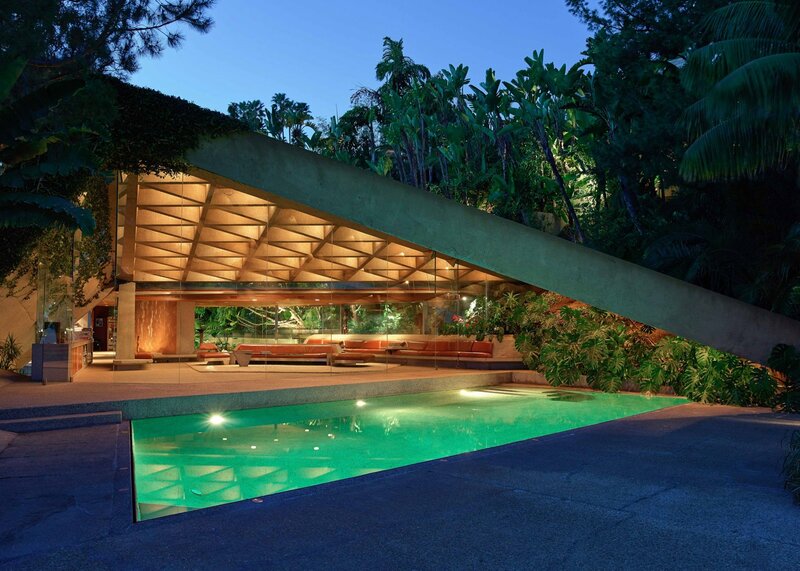 The Los Angeles County Museum of Art has announced that the art collector James Goldstein has donated his John Lautner-designed house, which famously appeared in cult film The Big Lebowski, to the museum. Along with the gift of the house, which features a coffered concrete roof with 750 tiny skylights, Goldstein is also giving his art and vintage fashion collection to the institution, as well as a $17 million (£11.9 million) endowment to maintain the structure and its contents. The five-bedroom, four-and-a-half bathroom house is surrounded by lush tropical gardens and set into a hillside overlooking Los Angeles. Originally built in 1963 for Helen and Paul Sheats, Goldstein acquired the house in 1972, and continued to work with Lautner on the house over the next 30 years, before the architect died in 1994. "Over several decades, Jim Goldstein has lovingly cared for this house, which is an exceptional example of domestic architecture and a tremendous legacy in our own backyard," said LACMA director Michael Govan. "Great architecture is as powerful an inspiration as any artwork, and LACMA is honoured to care for, maintain, and preserve this house, as well as to enhance access to this great resource for architecture students, scholars, and the public," he added. Over the years, the architect and client collaborated on custom furniture, redesigned the interiors, and replaced all the windows in the house. Working with Goldstein, Lautner added wooded ceilings to the interior and created built-in concrete furniture. "Hopefully, my gift will serve as a catalyst to encourage others to do the same to preserve and keep alive Los Angeles's architectural gems for future generations," Goldstein said. Following Lautner's death, Goldstein began working with the local architect Duncan Nicholson on a new building near the property's pool that includes a private nightclub and offices for Goldstein and his staff. The property also includes a "skyspace" by artist James Turrell, Above the Horizon, which was completed in 2005. The house appeared in the 1998 film The Big Lebowski as the home of the pornographer played by Ben Gazzara. Lautner also designed a spaceship-like house for himself in Los Angeles, now owned by the art book publisher Benedikt Taschen, and a house for Bob Hope in Palm Springs, California. Though Los Angeles has one of the most important concentrations of Modern architecture in the US, much of it is residential and inaccessible to the public. The Goldstein house is the first freestanding piece of architecture to enter the LACMA collection. In the public realm, Michael Maltzan is currently designing a new bridge over the Los Angeles River, and four teams are currently competing to redesign Pershing Square.